That’s right. Get your tissues out. It is time to talk about Bambi. 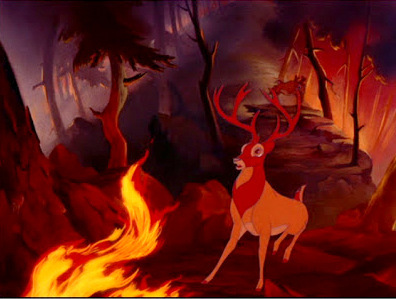 Yes millions of Americans have been forever traumatized by this sequence and probably even avoid watching Bambi as a result. If so, that’s a real shame because there is a lot to like about this Walt Disney classic. Bambi is based on a novel by Felix Salten and it evidently was ‘too grim’ for an audience with children (I can only imagine what horrors must happen!). At first, MGM was planning on adapting it as a live action film, but fter 4 years of attempts they handed it over to Disney. Disney planned on it being their 2nd feature after Snow White but delays in creating life-like animals made it not really get going until 1939. Eventually it would be the 5th animated feature by Disney and was released in 1942. 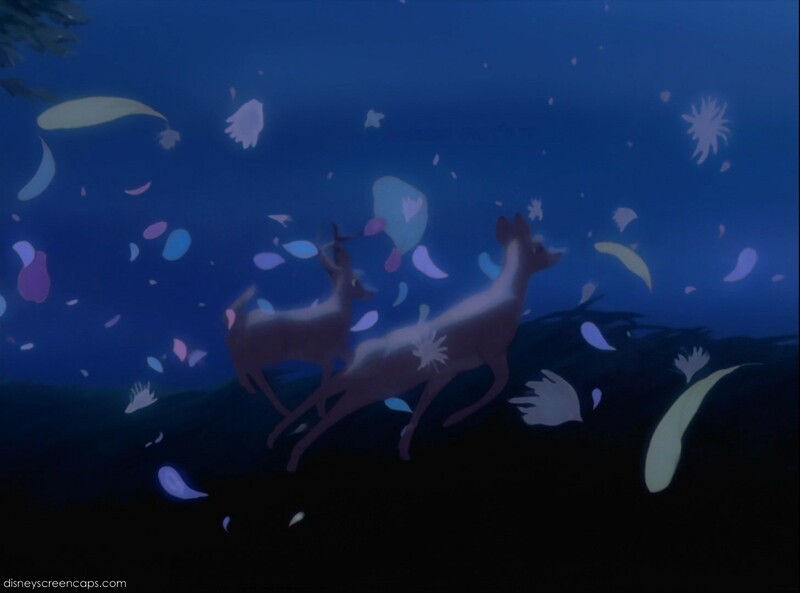 What makes Bambi special is the music and the animation- particularly the colors and backdrops. Along with most of Disney’s earlier works they can be appreciated more as an art piece than a film. A modern comparison would be Tree of Life. It has a thin plot but it is special because of the artistry. Same with early Disney. In the last post we spoke about Dumbo’s backgrounds being plain simple colors. Bambi is the complete opposite. If we look at this shot of Thumper and his girl rabbit the flowers and grasses closest to the characters have details but then it fades into an impressionist scene of meshing colors together. The animators also used color to show emotion throughout the film. For instance, during the fire sequence we get red, orange, purple and black. The other thing that is incredible about Bambi is the music. Taking a page from Fantasia Walt Disney decided to move away from sound effects to a complete orchestra and choir. None of the characters actually sing but there is music accompanying their actions. Watch this scene and listen for how the music creates the sounds of raindrops, water and the forest. Bambi was released in 1942 and with the war raging American pocketbooks were tight and the European markets were off limits. This caused Disney to lose money on Bambi (costing 1.7 million to make and only grossing 1.64). Immediately some hunters rejected the movie and still do. I’ve heard park rangers call the over-population of deer the ‘bambi problem’. Evidently even Walt’s daughter Diane didn’t like Bambi’s mother dieing but Walt said he was only following the book. This is another early Disney movie where there is no real villain. ‘Man’ is the villain but we never see them and they don’t have any distinguishing traits like a villain song or plot. So how does it hold up? This one I am a bit more mixed on. I own it and enjoy watching it for the imagery and music but certain parts are challenging. For instance, there really is no central plot. It is just the story of a deer growing up. Do deer mature so quickly that Bambi can go from being a baby to having his own baby in the 2 year time frame of the movie? I don’t know if they do but regardless this doesn’t give us much time to get to know him like we do Simba in Lion King. We never hear Bambi talk much beyond words like ‘ice’, ‘snow’, ‘meadow’ so it’s hard to feel much of a victory for him in the end. All the deer are pretty bland and boring. 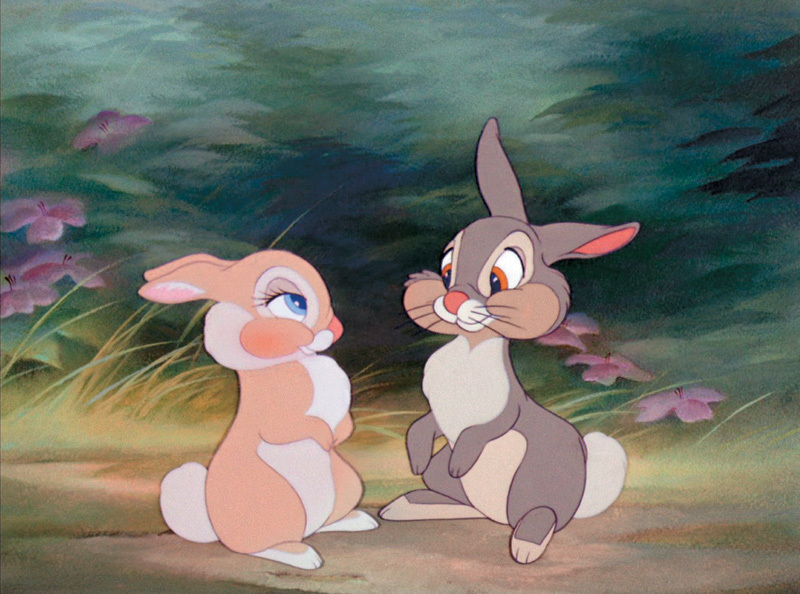 Thumper, Daisy, Owl are cute but not really that interesting. The death scene is very sad but it doesn’t hold a candle to what I feel when Mufassa dies- a character we have come to know, who has taught us something, shown some personality. Bambi’s mother and Faline are basically the same person and not that interesting of partners for Bambi. Aside from a Mother and various love interests all the rest of the characters are male and kind of blah and the story goes through the motions. Again, think about the Lion King and how much happens to Simba, the pridelands and everything else. Even Fox and the Hound, which is a weak Disney offering, still gives you some dialogue between the characters so the emotional scenes have more heft and the plot is more engaging. But, then there are the visuals and like most of Disney’s early films they should be viewed like one would go into an art museum or symphony. Every frame is gorgeous and the music gives you each emotion that the story might lack. 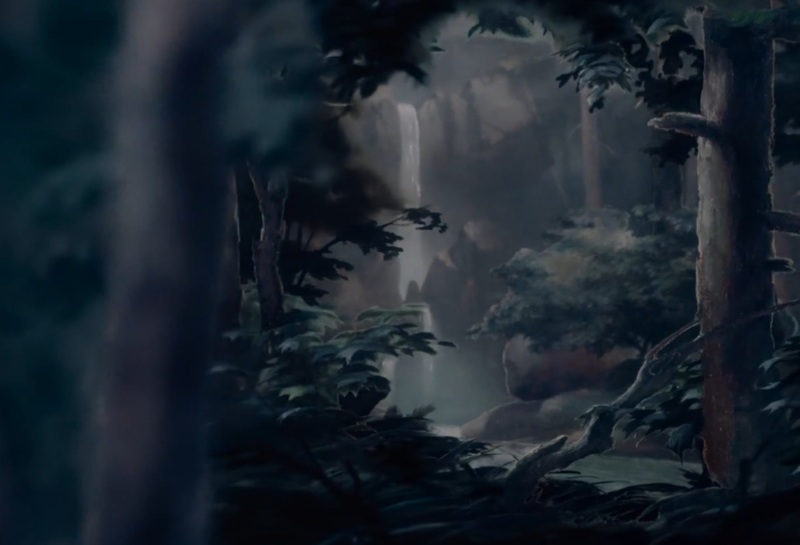 Just look at this forest scene. It is almost 3D with all the layers going all the way back to the waterfall. Stunning. So, do I think Bambi is worth owning? Yes. Is it one you are going to want to watch every month? No. It’s a beautiful art piece with great music and enough of a plot and characters to be tolerable, even enjoyable. It is interesting to think of these first 5 Disney feature films. They all have darker themes, many involving separation or death. A friend suggested to me that films were made for all ages at that time and animation was not as clearly a child’s medium. That makes sense in the pre-Disneyland days. But I wonder if it is also because of the hardships facing many families in the late 30s and 40s. People losing their homes, waiting in soup kitchens, sending family members off to war. Perhaps Disney wanted to provide a medium where these tough themes could be contemplated but through art, music and storytelling? Moving forward we get to a section I am calling the animated short era. From 1942 to 1950 Walt Disney Studios released groups of animated shorts put together to create a feature length film. This is partly because their studios were used to help in the war effort. I have not seen any of these except for the last, so it should be a lot of fun. Have you seen any of them? What do you guys think of Bambi and the other 4 early films- Snow White, Pinocchio, Fantasia, and Dumbo? This is a classic film that most people (myself included) revere more than actually try to watch over and over again. I want to be twitterpated! Aww man another person who doesn’t share my love for Bambi. It’s okay, I’m sure I’ll get the glowing review I’m looking for when I get to TLM and BatB. I like it just a B grade not A. I see a B as still a strong endorsement. It’s beautiful and I love the music. I actually own Bambi so I really do enjoy watching it. Sorry if I didn’t give that impression. It’s just not in my top 10 but I wouldn’t be surprised if it makes top 20. 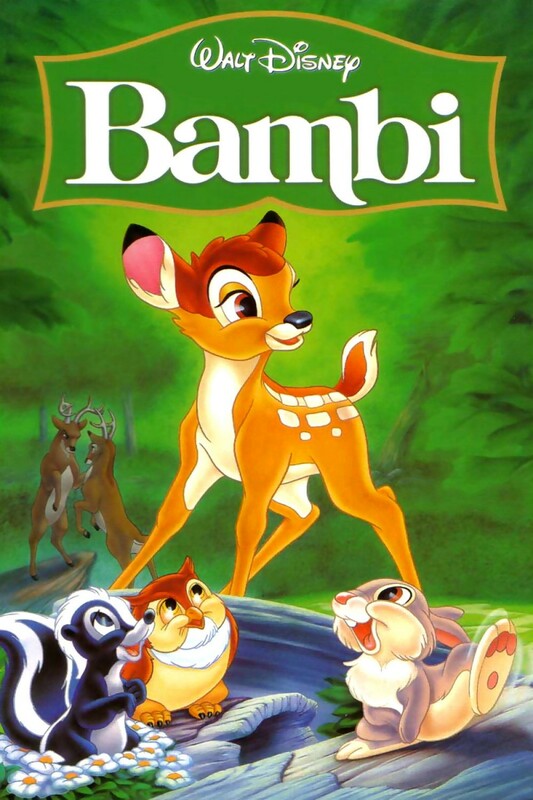 I would personally put Bambi in my top 5 best animated films of all time, so I am very fond of the movie. Most people complain about the lack of plotting, but I think that’s what gives this movie its magic. It’s like fantasia with a story and characters behind it. I agree that it is beautiful and I think the soundtrack is a bit underrated. Definitely captures every emotion the movie portrays. I heard about that somewhere across the internet. Apparently his favorite fairytale was Cinderella, which I assert is his second best film (only behind Bambi). I love it when a filmmaker can critique his own work! I think maybe I was a little bit hard on some of these early reviews because I hadn’t gotten in the hang of it yet. I would definitely give both Pinocchio and Bambi As. I love them! As an analytical adult now, I tend to find the story for ‘Bambi’ a little unengaging. Now I know that having a complex narrative isn’t the point of the film at all, but after a while I get the sense that after so many views the impression I get is that I’ve “seen” ‘Bambi’ already, and there’s not as much drawing me in as I’d hoped on more recent viewings. I know part of the charm is in the animal character’s innocence and simplicity, and I do try to remind myself that. Now don’t get me wrong, every time I start the film I’m once again enamored with its animation, visuals, music, atmosphere and most of its humour. I still get choked up during the infamous death scene, and the overwhelming sense of desolation that’s left at the end. How the movie portrays nature has that timeless quality that matches reality practically beat for beat. You can see a cartoon from the 30s or 40s and easily when it’s from by looking at the human characters or cartoon animals, but when Disney made a film this true to nature, it’s almost unrivaled for accuracy and charm. The one part I don’t like is the incredibly painful transition between the death of Bambi’s mother and the happy scene in Spring. I can only theorize that back in the 40s, cinemas still had intermissions and so after ten or so minutes for the audience to collect their emotions, they went back into the film to a more upbeat experience. Still, I wish they had placed at least a minute of allowing the feeling to wear off before the Spring scene showed up. Though to answer your earlier question: yes deer actually do mature much faster than humans, and between the age of 1-2, most deer are old enough to start mating. The team over at Disney did do their research, like The Lion King they brought in live animals to study and sketch in order to get the movement and expressions right, and it paid off beautifully. Cool. Thanks for clarifying that. I didn’t know that about deer. I gave Bambi a B because I do think the story.holds it back just a hair from being a top tier film. 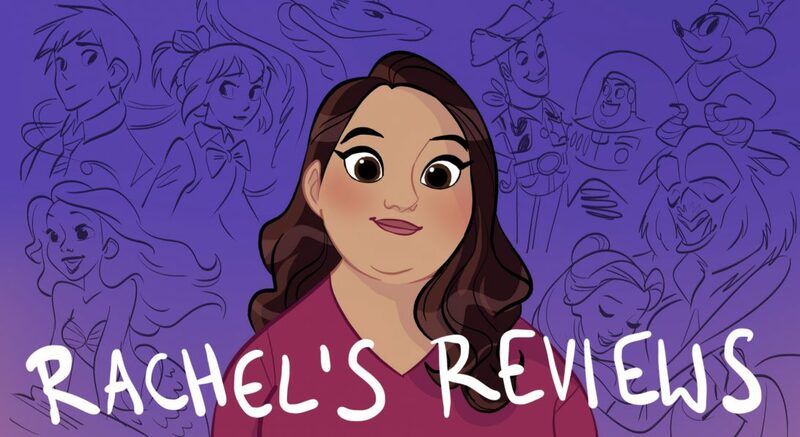 It’s great and if I was comparing it to movies at large it would be an A but in the world of the Disney Canon it is just a little bit weaker than the best of the best. Basically it’s just a year in the life of a deer. Pretty simple but sweet and also upsetting in parts as life for any creature will be. I didn’t mind the shift in tone because for the type of movie it was it made sense. A year in the life of an animal especially one that matures so quickly is going to have dramatic events followed very quickly by silly ones. Did you see Tale of Princess Kaguya? It actually had some elements that reminded me of Bambi oddly enough. It is about this girl growing up and finding food, making friends, growing, and then it has drama, sadness joy and it is visually stunning. According to the Wikipedia article for deer, fawns do leave their mothers one year after birth, so the 2-year timespan of the film does seem plausible. However, the father stepping in to care for the fawn once the mother is shot, that’s one way in which this & other films project human qualities onto animal characters. Also, from what little I know about the ethics most hunters follow, they target male animals rather than females because the female is the limiting factor in reproduction & the one that cares for the young. I agree with you that Bambi is a absolutely beautiful movie with great music. As you said, not one I’d watch every month, but a good film. I actually have read the book (years ago), and it is rather depressing. The deer are more “realist” in that they have very limited memories. Faline has a twin brother who is captured by man, and while he’s gone the deer forget him, although he is later released and he is then sort of remembered – but not for long since hunters show up and he’s been conditioned to not fear man, so is quickly shot. Yay? Anyway, I generally like this movie and don’t feel it’s too traumatic for kids (I may be unusual in that regard). I could do without the message of “hunting is bad”, but more modern films are more heavy handed, and I don’t feel this one shoves your face into pro enviormenalism too severely. M6 rating is a B-.